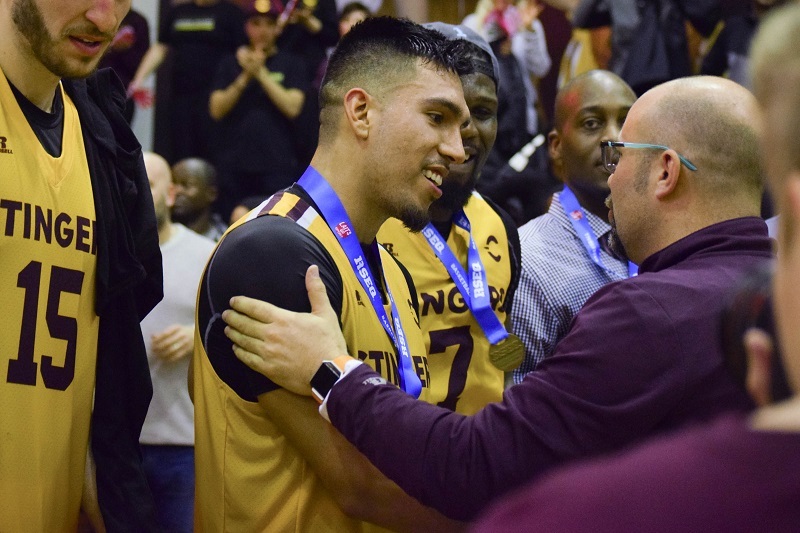 A month ago, Ricardo Monge led the Concordia Stingers men’s basketball team to the Réseau du Sport Étudiant du Québec (RSEQ) title. He had a 19-point performance over the UQAM Citadins, concluding his career in the league with a first championship. Few players can say they concluded their career by winning a championship. Monge’s last season with the Stingers is hard to describe. Rastko Popovic (left) instructs Monge during the RSEQ final on March 2. Photo by Mackenzie Lad. Monge began his career with the Stingers in 2014-15, when he played 13 games. The Gatineau native said he was ready for the challenge of playing university basketball after three years at John Abbott College. When head coach Rastko Popovic, recruited Monge, he saw a hardworking player and a great teammate. The point guard averaged just over 15 points/game this season. Photo by Mackenzie Lad. Monge’s development has been impressive during his five years at Concordia. The point guard finished every season with more points than the last, as he went from 106 in his first to 248 in his last. Monge had few expectations when he started at Concordia and simply focused on his game. Popovic said he always told Monge that he had the work ethic to have these kinds of results. The head coach explained that Monge is committed and wants to get better every season. After nominations to the all-rookie team in 2015 and the second team all-star in 2018, Monge earned RSEQ honours for a third time this season. He received all-Canadian honours and was the MVP in Quebec university men’s basketball conference this year. According to Popovic, these are well-deserved awards for someone, who, five years ago, arrived at Concordia with low expectations. The head coach said that Monge will be an amazing role model for Stingers players.